Liza Balkan watched a man die during an altercation with Toronto police in August 2000. His name was Otto Vass. At The Theatre Centre, she retells that six minute confrontation and the years that followed. After seeing her groundbreaking work Out The Window, I feel like I was a witness as well. Balkan has spent the last dozen years creating a living work of art she calls “part play and part public forum”. I would call it more than a play and less than a play. She introduces Out The Window as only a great educator can, inviting us into a new world, making us curious and involved. In that way it is more than a play. I would call it “less than a play” because it is more of a reading than a glossy production. I found this to be an effective tool for engaging the audience. It really broke down the usual “the artists on stage” versus “audience” divide. There is a shared sense of community as a result. This is one of those times when less is more, and just one of many bridges that Out The Window builds. I also felt like I was at the trial and inquest of the four policemen. They were on trial for manslaughter. Otto Vass died after police attempted to arrest him on that August night. The portrayal of the first legal proceedings reminded me of 12 Angry Men. It was incredibly powerful, edge-of-your-seat stuff. I also feel like I knew Otto Vass. He was troubled, like all of us. He was also a family member, a dad, a human being. He was 55 and didn’t deserve to die that night. Out The Window helped me empathize with a man I never met. The whole of Out The Window is greater than the sum of its parts. That being said, some parts are more effective than others. The police scouring a darkened theatre with invasive flashlights is inventive and highly effective. The four actors playing the police, Brett Donahue, Andrew Ferguson, Zahir Gilani and Nadeem Umar Khitab make them multidimensional, human. At times they are quite animated. At other times they read while in court. The actors bring home the point of how officers are coached on what to say and how to behave in such situations. Speaking of exceptional acting, David Ferry and R.H. Thomson play two lawyers. They seem to share a real chemistry. The authenticity and earnestness between Ferry and Thomson reminded me of My Dinner With Andre. I’ve really got to see these two perform again. 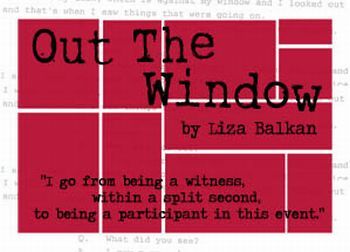 One piece of the Out The Window pie has six audience members having a meal with the lawyers and Balkan (Julie Tepperman). The onstage volunteers seemed somewhat shy during this segment. They probably felt like most young men do when having dinner with their girlfriend’s father for the first time; afraid and in awe. I also feel familiar with Deputy Chief of Police Mike Federico, former Mayor of Toronto John Sewell and activist/lawyer/mathematician Peter Rosenthal. They were panelists on the post-show discussion the night I attended. I didn’t much care for the discussion. It was definitely a great idea, as was the live Twitter feed. It’s also great that these distinguished men appeared. Some important bridges were built as a result. I didn’t like it because the questions from the audience weren’t questions at all. I found it to be boring venting. I felt trapped in a failed university lecture. It takes all parts to make a whole. In this case, there is something one can do. As a result of seeing Out The Window, I am a better citizen. I now have an understanding of SIU procedures and an inkling of what it’s like to be a Toronto cop. I’ve also been awakened to mental health issues. The more I think about Out The Window, the more I appreciate it. The talent onstage is exceptional. Liza Balkan’s long, hard work is extraordinary. That the audience is included in such a public forum is vital. This is art that heals and transforms. It is art that connects our community. It makes Toronto a better place. I strongly suggest seeing this play if you have the chance. Hopefully it is staged again and enjoys a longer run.